We all love gathering, BBQ party is an easy and convenient way that warm up the party. Therefore, choosing the right portable BBQ grill is what you need to do. If you like outdoor activity, then you have to consider about the weight and size of the grill, to make sure it is flexible and comfortable to bring along. Using a gas grill is convenience as we don’t need to worry about the smoke caused by the charcoal and we can also properly control the fire. We know and understand that identifying the right item from the many products is indeed a challenge. You may be overwhelmed and confused by the selection. 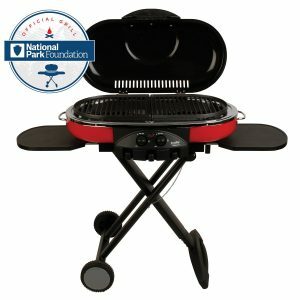 To help you waste no time and spend minimal effort, we have reviewed the popular items and come up with the following top 10 best portable outdoor gas grills in 2019. 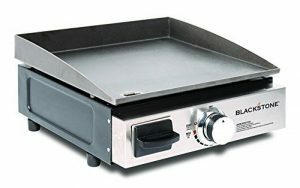 The premium grill/griddle by Blackstone measures 8.5 x 16 x 17.3 inches and covers a cooking surface of 260 square-inches. Weighing 24.7 pounds, the unit has a heat output of 12,000BTU and offers a wide range of cooking options. The stainless steel H burner not only heats up fast, but also distributes the heat evenly. Although it is designed to use a 1 pound gas tank, it can be converted for bigger capacities such as 14, 16 or even 20-lb units. Igniting the unit during your camping, road trip, tailgating or fishing is made easy thanks to the user-friendly igniter. The Coleman Fold N Go is undoubtedly among the most potable outdoor grills in the market. It has a small size of 4.5 (L) x 16 (W) x 14(H) inches and only weighs 10 pounds. The stainless –steel made product is not only compact but comes with a foldable design including folding handles. For longevity and improved functionality, it boosts of a dome-shaped lid, heavy-duty hinges and porcelain coating. It also comes with a removable grease pan, dishwasher-safe parts and a stamped stainless-steel grate. The U burner measures 27(L) x 12(W) x 17(H) inches and covers a surface area of 305 square-inches. 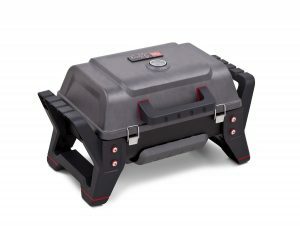 The portable grill which can be converted for use with 20-lb gas tanks features a warming rack and removable grease tray. For easy transportation and storage, it comes with foldable legs and lid locks. Covering a cooking area of 180 square-inches is the 12,000BTU Camco Olympian grill. The body and burner are constructed form stainless steel while the grate is made from cast iron. The 24 x 15 x 12 inch unit can use a 20-lb. 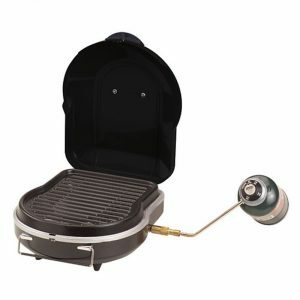 In addition to featuring a removable grease tray, folding legs and electronic ignition, the outdoor grill comes with a quick-connect 39-inch low-pressure hose for RV use. It requires frequent cleaning since food particles and other things tend to stick to the chrome-plated steel surface. 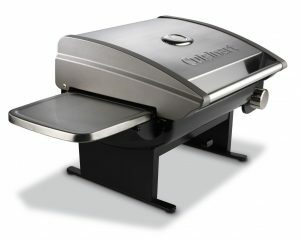 Cuisinart gas grill is very portable and weighs 18.5 pounds and measures 13 (L) x 16.5 (W) x 16(H) inches. The tabletop with stand unit has a grilling surface area of 145-square-inches and is powered by 5,500 BTU. Consisting of a stainless steel burner and a porcelain-enameled grate, it evenly distributes and conservers heat.Since they are made from aluminum, you shouldn’t worry about the legs rusting. This grill is however intended for small items only. The Char-Broil brand boasts of owning a true infrared portable gas burner. You will be able to enjoy well-cooked food that is prepared using revolutionary infrared technology On-the-Go. Covering an area of 200-squre-inches, the 23.7″W x 15.7″D x 13.6″H, 20 -pound unit produces 9,500 BTU of heat. It features a stainless steel grate, a temperature gauge mounted on its hood, and can be converted to use a 20lb-tank. 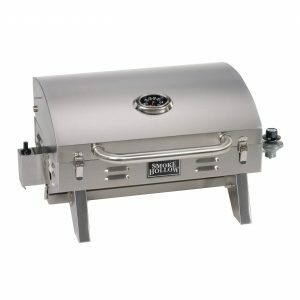 Other useful features include high-impact frame, cast aluminum firebox, carry handles, and two stainless steel latches. 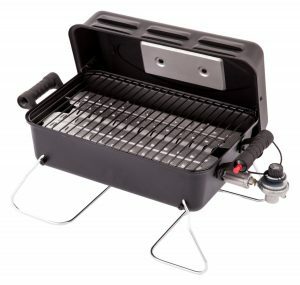 The 190-square-inch Char-Broil deluxe portable gas grill is powered by 11,000 BTU. It measures 15 x 24.1 x 12.3 inches and weighs approximately 10.95lbs. The grill is made from stainless steel and is coated with high-temperature porcelain enameled finish. The on-the-go cooking device comes with foldable legs, lid lock and heat-resistant handles. While very effective, it’s only suitable for light duties or small meals. 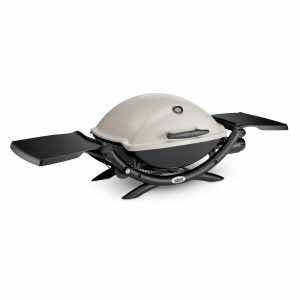 Rated at 12,000 BTUs and measuring 20 (L) x 28(W) x 13(H) inches, the Cuisinart gas grill can easily reach temperatures of 500 degrees F. It comes with a simple and reliable twist-start ignition for quick starting. 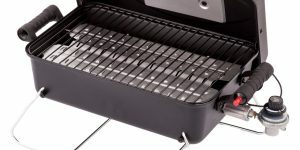 The one- piece grill features stainless steel handles and lid while the modular grill is made from porcelain-coated cast iron. A temperature gauge, folding shelves and a removable grease tray are the other attractive features. The Weber Q2200 is a single stainless steel burner that is rated at 12,000 BTUs. It features an aluminum lid and body and porcelain enameled grates made from cast iron. Measuring 21 x 27 x 24 inches and designed for use with a 20 lb tank, the grill comes with 280 square-inch surface area. For easy starting, the item comes with a simple electronic ignition button. Other features are the two folding side shelves, removable grease tray, and burner valve control. A few complaints have however arisen about the small holes that make it a bit challenging to clean the burner. 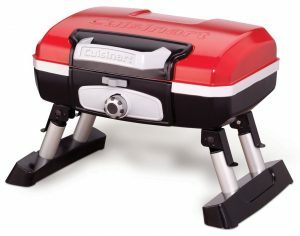 Just as the name implies, the Coleman gas grill is your perfect companion during your road trip and other outdoor uses. It is powered by two 10,000BTU burners that give a total of 20,000BTU. The large 285 square-inch unit has dimensions of 46 x 18 x 35 inches and comes with independent controls for each grill. It can easily be converted for use with a 20-lb tank. Thanks to its collapsible scissor legs plus two wheels, storing and moving the burner is easy. You don’t need to feel the heat due to inability to control the heat and temperature. Also, you need not struggle moving or using the grill in the outdoors, or worry about it being harmed by the elements. By reading our review, you will find the ideal product that is reliable, clean, portable and also long-lasting.